Weekend Reading: The Hermit from the World Spirit Tarot. Pay attention to dreams, visions, "coincidences" and the voices in your head this weekend (assuming you're sane). They could contain valuable spiritual insights to guide you further along your path. 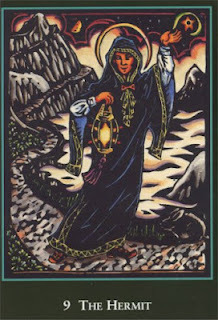 The Hermit is a seeker of wisdom and truth and often that wisdom is found in the quiet places within. So make time for reflection over the next couple of days, too. Keep in mind that anything that comes to light could be valuable to someone else, so share the wisdom within and become a guiding light for others.